A fabulous change from the traditional Christmas turkey or a great addition if you are cooking for a large crowd, a baked ham recipe can be festive and flavorful. Baked ham is one of those meals that are, in reality, a feast. The sheer size of the ham lends itself to family gatherings and buffets. A typical ham can feed up to 16 people and, if you add other entrees to the table, the amount of people you can feed reaches into the dozens. The cooking method for baked ham recipes vary depending upon whether you have a fresh ham, cooked ham, or cured ham. I suggest a nice smoked ham since the smoky flavor will combine well with any glaze you care to use. Often, the baked ham is finished with a glaze, which adds color, texture, and flavor to your baked ham. Glazes can be very simple and range from sugared glazes to fruit based glazes. This recipe calls for one 15-pound smoked ham that will serve up to 25 guests if you are serving five-ounce portions of ham to each person. If you are planning to serve somewhat fewer guests, I would still go with the 15-pound ham because the leftovers are incredibly useful for a myriad of recipes from basic ham and eggs to breakfast burritos. Usually, a ham of this size will have the bone still in place, which can be used to make a wonderful pea soup. 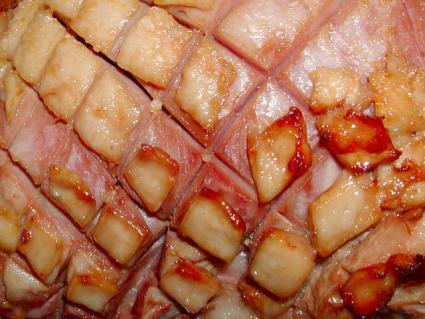 For this baked ham recipe, I am using a cider sauce and a basic brown sugar glaze. Cloves are a very good friend of ham and it is not unusual to find a baked ham served with whole cloves studding the scored surface of the ham. I like the way that looks, but I prefer to use ground cloves in the glaze itself. I find that this method imparts a richer, more evenly distributed clove flavor to the ham. In the following recipe, I list brown sugar twice... this is not a mistake. The first measurement of brown sugar goes into the glaze while the second measurement of brown sugar goes into the sauce. Place the ham in a stockpot large enough to hold the ham covered with water. Simmer for one hour and then drain the water. Cut off the skin and excess fat, leaving about ½ inch of fat covering the ham. Using a pairing knife, score the ham by making a series of diagonal slices (through the fat but not into the meat) across the ham. Repeat the same kind of slices in the opposing direction so you end up with a diamond design across the ham. Place the ham, fat side up, in a roasting pan with a rack. Spread the mustard in a thin layer over the ham. Mix the first brown sugar measurement and the ground cloves thoroughly. Sprinkle the ham with the brown sugar/clove mixture. Since sugar has a tendency to burn, check the ham at 30 minutes. If the sugar is getting too dark, cover the ham with a foil tent. Bake the ham until an instant read thermometer reads 140 degrees. To make the sauce place the cider, raisins, second measurement of brown sugar, nutmeg, and lemon zest in a saucepan and simmer for five minutes. Mix the cornstarch with enough water to liquefy it. Stir into the sauce and simmer until thick. Aged country hams need to be soaked for 24 hours in cold water, scrubbed, and simmered about twenty minutes per pound before you can bake them. Aged hams sometimes have a small amount of mold on the outer skin; this is ok and will be removed by the scrubbing. Hams labeled "ready to cook" can be baked without the initial simmering. To use a fruit glaze, don't coat the ham with mustard. Instead, coat the ham with fruit preserves during the last half of the cooking time. Any fruit preserve will work, but I have had good results with apricot.